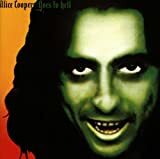 Quotes about and from Alice Cooper at the largest music humor site on the web. Check out the index for other performers we have quotes about and from. - Submitted by: Don't Blame Me, I Voted For Alice Cooper!